Stock photo of a refreshing swimming pool at Punga Cove Resort in Endeavour Inlet, Queen Charlotte Sound, Marlborough, South Island, New Zealand. Refreshing swimming pool of the Punga Cove Resort has a beautiful view of the Endeavour Inlet. 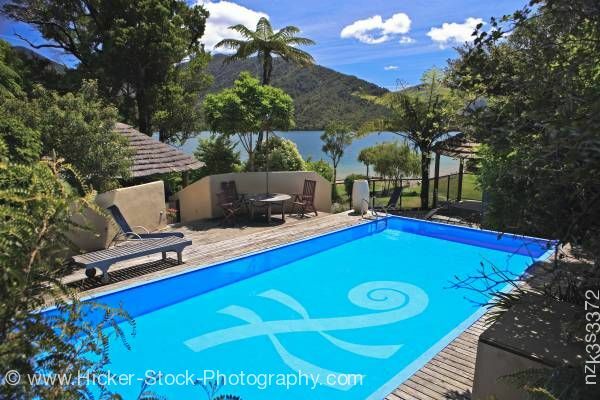 This stock photo shows the swimming pool at Punga Cove Resort in Endeavour Inlet, Queen Charlotte Sound, Marlborough, South Island, New Zealand. The clear blue water of the resort’s swimming pool has an emblem or logo in white on the bottom of the pool. The logo has a slanted line with a curl at the top and two wavy lines run horizontal through the slanted line. To the left of the pool, a few lounge chairs and a table sit on the wooded platform that surrounds the pool. A concrete wall is behind the chairs with an opening to lead downstairs to a round hut. Various types and sizes of trees surround the pool area. The pools view shows the gorgeous view of the mountains and the beautiful blue waters of the Endeavour Inlet. To add to the beautiful day, the sky is bright blue with white puffy clouds. Swimming pool at Punga Cove Resort in Endeavour Inlet, Queen Charlotte Sound, Marlborough, South Island, New Zealand.